Regardless of the fact that our first encounter with a Turk was a cheeky trickster who tried to steal our cash card and pinch our pin, ignoring the man who overcharged us at the gas station, or the one who tried to get us to pay double the usual dolmus (local mini bus) price, we concur with the default position cited by our Turkish mucker – the Turkish default position is to offer help. Overwhelmingly, in our humble, generalised, and minimal experience, the Turks have been super helpful. Indeed considerable care needs to be taken when stopping for a rest or lingering just a second too long over a map for a veritable cushion of the very helpful might rapidly descend! 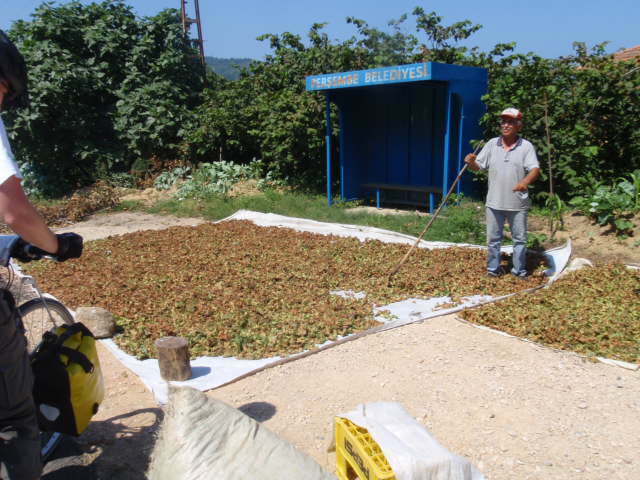 For the last 200km’s we have been passing through Turkey’s Tea region. Heady black-tea aromatics have blunted the usual mix of turgid engines and hot tarmac. The roadside hills have switched seamlessly from twiggy hazelnut trees to stubby carpets of tea bushes. Yet the early morning trucks crammed full of pickers still whistle past just the same. We wonder often about their lives as our winding hours in the saddle follow them from pick up to picking and back home again – home that often appear to be transient and nomadic and is often a makeshift camp of some sort. Last night was the start of Ramadan. We hope so at least, otherwise there was some wild west shoot out occurring just outside our hotel! To show respect to those fasting we spent the morning furtively sipping water behind parked cars and worried our way through a packet of biscuits before registering the vast number of people drinking water and hoeing down on ice creams! *sigh* obviously it’s an if-you-do-you-do-if-you-don’t-you-don’t kinda thing. 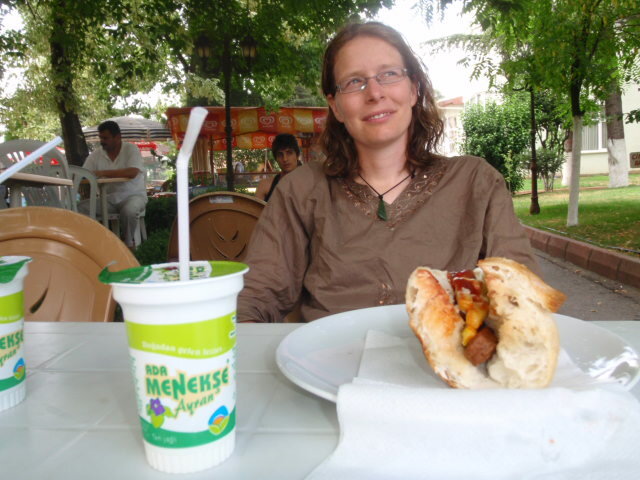 It will be interesting to see how Ramadan affects the persistent, cheery cries of Cay (Chai) that have floated behind us as we have whistled up the Black Sea coast. The Turkish drink tea. A lot of tea. Tomorrow we will be heading into Georgia (Catherine’s stomach permitting). Check out our little dodgily edited video…. If you want to get between Unye and Ordu, two key locations on the Black sea coast, you either take the 4km tunnel between Fatsa and Ordu or you take the old coast road. Interestingly (and maybe worryingly) our ‘up-to-date’ Rough Guide map doesn’t have the tunnel route marked (?!). Eager to steal a bit of respite from the thundering (and thus far, purringly flat) E70 we swung left at Fatsa to follow the old coast road out to Yasun Burnu. As with our previous sojourns off the highway the difference is immediate and palpable. The rattling fear that crunches through your jaw every time an interstate bus cuts a little too close, the constant sense that you are riding a great imposition of a road that rapes its way through the otherwise sedate and rural lives of the local people; Gone in a sigh. For once a road that roles with the contours of the hillside; that makes you work the inclines but rewards you with constant mountain shade, swooching descents into picturesque little fishing villages, and locals who call out to pile you with great handfuls of fresh findik – hazelnuts [that bit may be seasonal..]. It’s a super day’s cycling but commitment is needed as there are no ‘otel’s’ between Fatsa and the relaxed little seaside town of Persembe. However there are plenty of watering holes along the way and once you arrive in Persembe you can relax in a sea front restaurant stuffing yourself full of fresh fish, local meze and Ayran to replenish lost salts! However there is a price to be paid; the cost is the ever present ‘effort to distance-travelled’ ratio. Yesterday (Wednesday) we covered 88km, from Samsun to Unye, in 6 hours and today we only managed a hard fought 62km in 5 hours (in both cases before the midday heat drove us off the road). I guess this is the constant dilemma of the long distance cyclist; we are not on holiday, we don’t have the luxury of the idyllic meander. We have a responsibility to get to Thailand in 9 months; we have to shake a leg, grit our teeth, and do the do. If we have free days or free time there is the constant business of trying to contact schools or getting out talking to people about HIV/AIDS. Can this only be done in big towns and major cities? Yes, more people are likely to speak English, but quite frankly I’m not sure if communication needs to be that verbal for meaningful opinions to be aired. Every time we stop, and little conversations break out, we show our magic letter, which usually illicits much shaking of hands, bringing of drinks, presenting of cloths and, on one occasion, offering of cigarettes (?!). Often time’s people will then share their thoughts and feelings about the impact that HIV/AIDS is or isn’t having on their lives or in their country. Through the use of the magic letter, our faltering Turkish, their faltering English / German / French, our blow-up globe, and a good few choice hand gestures, opinions are usually clearly enough made. Maybe they will go home and tell their families about the scruffy loony cyclists they met that day and maybe they will mention HIV/AIDS and maybe they will know that it’s important enough for us to shake our legs and grit our teeth and clench our jaws every time a bus passes too close. ….And maybe, with some miles under our belts, we can do some of that on the littler, hillier, roads too. Being chased by a looney on a bike for 2 km’s is enough to make you throw down your cycling hat and grab for a cool fresh bottle of chocolate milk! A lecherous stick insect with double wing mirrors and an extravagant display of glittering mud guardary had been continually speeding past us and then slowing down, staring and laughing at us for over 2 km. Fearing for all our lives, and with increasingly crusty patience, we decided to pull into a petrol station for a temper cooling chocolate milk drink (definite spirit booster). Thankfully the stick insect didn’t stop. As ever our bikes caught the eye of the owner who brought his two cheery, round faced daughters out for a chat and to see what we were up to. Our magic letter caused much discussion and soon we were joined by their excellent English speaking son. As we explained our plan for the next few days the family erupted into a veritable hubbub of concern and dire warnings. The section in question is between Duzce and Bolu – basically a steep 1000m climb, in 40 C heat, with no hard shoulder. This is not the first time we have been warned about the dangers of this particular section and it was beginning to dawn on us that maybe we should look at the bus option. It was at that moment that the son noticed Liz’s missing toe clip, which had worked itself loose a couple of days ago – within minutes he had rushed off to the adjacent workshop and set about finding a replacement nut and bolt (with a couple of spares – just in case). Meanwhile the two daughters scurried away to return moments later with a gift… a chamois and car air-freshener for each of us… we are thinking about hanging them on our bikes so that we can smell more fragrant than our scuzzy t-shirts! Having missed the previous chamois presentation the son also then gave us two more chamois along with some very useful instructions on how to get to the local bus station. … so from one petrol station we have 4 chamois – that’s a whole lot of bike cleaning for us to do! Round the corner at the bus station we ran into another English speaker – who very helpfully sorted us out with bus tickets and times… splendid! 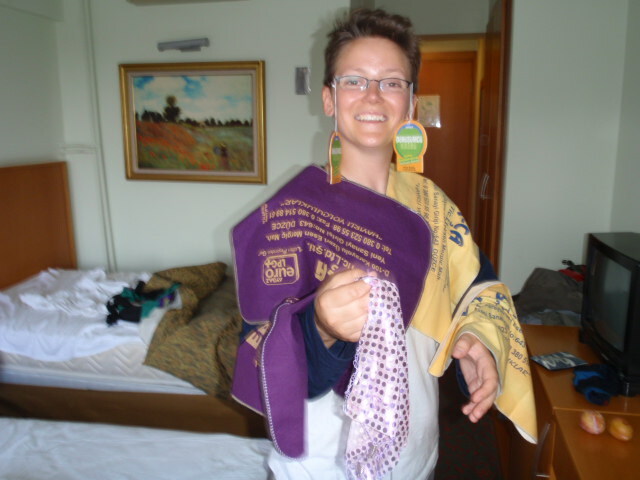 After 20mins of chat about universities, our trip, the project etc she then presented Catherine with a piece of cloth. Her sidekick – who clearly knew more English than she was letting on – was using a translator tool on her phone for the odd word where the great English speaker came unstuck – translated that this cloth was used for pole dancing at weddings… I think there was something lost in translation with that one! But splendid we can add it to our growing cloth collection (Is this cloth giving a local tradition?!). What interests me, is why did she have this piece of cloth in her bag – was it just in case she ran into some random stranger whom she might want to give a gift to… God only knows what we might have been given if she hadn’t happened to have a handy piece of cloth in her bag.. maybe people all over Turkey are lugging about bags stuffed to the rafters with little bits of cloth ‘just in case’….. I guess we’ll never know the answer to that. We are trying to find out a little more about the wedding dancing traditions in Turkish culture – to fathom the pole dancing mystery! Anybody got any ideas? A golden rule in cycling… only ever ask the way of a fellow cyclists if you still have cycling legs in you. Last Sunday, as the furnace of the midday sun threatened to breach our factor 50 sun block and we were mid searching for a suitable pool of shade, 3 cyclists sped by the other way singing out a chorus of colourful cheery toots …. only to turn around and frantically catch up with us. After much admiring of bikes and kit two of the three sped off about their business, one stayed to help us find an ‘otel’… we thought. Fuat’s English was about as painful as our Turkish. But we communicated with sign language, through the lonely planet list of useful words (not all that useful) and through sharing websites and facebook on his blackberry. Fully loaded with a fine array of tough looking outdoor gear we shouldn’t have been in the least surprised when he kindly provided us with a can of US Army mace to protect ourselves from the dangerous Georgians! 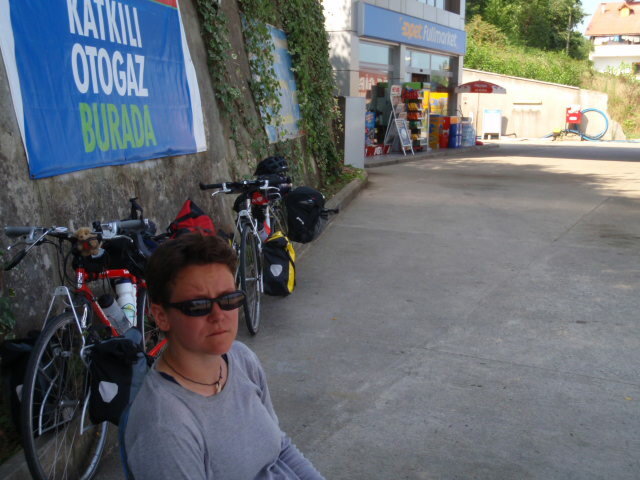 Our first proper day of cycling… heat, sweat, chai, grit and the Turkish roads. From Yalova (on the southern shore of the Marmara) we kicked off early along the main 575 dual carriage way. 45 mins in, with sweat pouring down our backs and grit clogging up our eyes, we decided we needed a better ‘Plan A’ – Let’s try the small village roads to cross this line of hills rather than the longer flatter route on the main road with all the belching long distance trucks … good plan! …3 hours of grinding our bikes up gravelly roads later and we decided to head back into the dusty, fume blanket of the 575! Lesson learnt: small purple ‘village roads’ on the map may be stunningly beautiful but they are HARD HARD HARD to cycle on with their slippy, gravelly surfaces and unforgiving inclines. Our super buds in Istanbul pulled us together a ‘magic letter’. The purpose of a magic letter is to offer a brief explanation (in Turkish) of what the heck we are doing! We used it for the first time today – a delightful (if insanely archetypal) little old man in the village of Kilic desperately wanted to know what these crazy foreigners were doing… and we were able to oblige! This lead nicely to a cup of tea, a stream of men (always men – few women in evidence) providing advice and directions to get us to our planned destination, and an offer of breakfast! It’s beautiful that asking directions of a group of men in any country results in the same discussions, disagreements, agreements and fingers branching out in 360 degrees, bless them for their offers of the ‘best route for cycling’… all we wanted was the black tarmac! Thus our ‘exertion to distance-gained’ ratio was limited in its effectiveness today. Three days in Istanbul spent with a native Turk, and our prize language skills managed to omit learning ‘left’, ‘right’ and ‘is it a paved road?’… a bit of swotting up tonight should see us flying along (hopefully on tarmac) tomorrow!